(a) The principal purpose of The Institute of Music in Medicine is to foster and advocate the therapeutic uses of music in medical care. 1. compassionately serve those facing life threatening illness, the dying and their loved ones with prescriptively played music. 3. value all religions, faiths and cultures without favour. 4. extend the music repertoire where possible to include the diverse musical traditions of Australia's indigenous and multi-cultural populations in order to serve their needs appropriately in relation to their experience of death, loss and grief. 5. engage in research of music in medicine practices, and pioneer advances in this field in order to improve patient outcomes. 6. encourage the growth of this field through the education of the medical, academic and broader communities in the value of this practice as an alternative to the traditional cultural and biomedical responses to issues of death, dying, grief and suffering. 7. expand the offering of music-thanatology in Australia through the training of practitioners. 8. produce public artistic performances to provide comfort, deepen understanding, and inspire change on a broader social level concerning the value of the human need for care of the soul through musical offerings in sickness, death and dying. 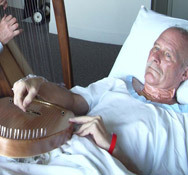 * Music-thanatology is recognized as a sub-specialty of palliative medicine which addresses the physical, spiritual and emotional needs of a dying patient with prescriptive, live music. ( c) The IMIM is formed for the exclusive purpose of pursuing charitable purposes only and its income will be applied to promote those charitable purposes.